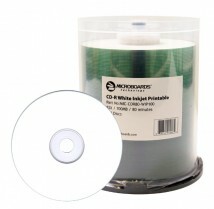 Use an economical yet trusted brand of CD-R media—the all-new Microboards brand! The White Inkjet CD-R media's surface allows for beautiful full-color printing. Designed with duplication in mind, Microboards' White Inkjet CD-R Media is fully licensed by Philips. Record at speeds up to 52X, and store 700MB of data or 80 minutes of audio. Also available in Shiny Silver for thermal printing.